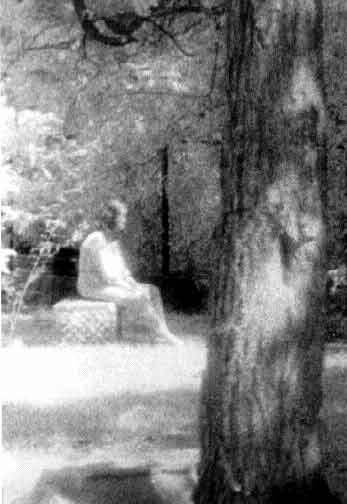 This photo was taken during an investigation of Bachelor's Grove cemetery near Chicago by the Ghost Research Society (GRS), on august 10, 1991, using black and white photos with a high-speed infrared camera in an area where the group had experienced some anomalies with their ghost-hunting equipment. When developed, this image emerged: a young woman dressed in white sitting on a tombstone. She was not visible to anyone who was present and in fact, the image appeared in a much larger, almost panoramic view of the cemetery. The portion of the photo where the woman appears was enlarged when investigators noticed there was something out of the ordinary about it. The photograph appeared in both the Chicago Sun-Times and the National Examiner.